Usually, We write posts addressing our students and suggesting them about various things. But this time we have decided to suggest our fellow teachers about a few things that they should take care during their IB Tutoring. Whenever you start a new topic with your students don’t directly jump towards the difficult part of that concept. Suppose you are teaching Quadratic Equation then, first of all, you should tell your students about the name of the topic. IB Maths Tutors should spend a few minutes discussing what actually an equation is. And what is the meaning of Quadratic? Some people may find it silly. They think that grade 10 or 12 students might already know about it. Perhaps these people are correct but still, it will benefit you because it will provide you with better connectivity with your students. And this connectivity will help you in your academic delivery. Never make constant rules in your mind while tutoring your students. Every student is different his or her needs are different. Every one of them has different learning patterns. Some of them are good listeners while some are not. Some learn through visuals and some are practical learners. They want to do things practically. 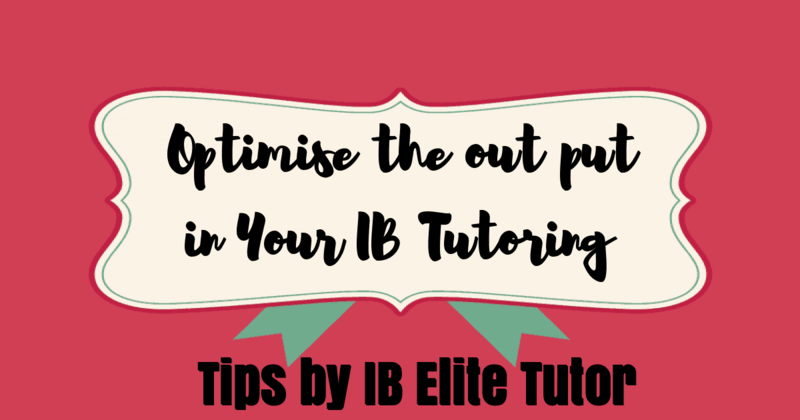 so as IB Tutors in Delhi or as Online IB Tutors, we should, first of all, try to understand the learning pattern of our students and then we should deliver our IB Tutoring accordingly. By can understand their patterns by constantly asking them questions and noticing their response to these questions. If you are tutoring any students whether as a home or online tutors, then the ultimate aim is to develop an understanding of the student in your subject and to make him perform better in his or her exams. But no tutor can alone achieve this goal. There is a team that involves the tutor, students, and their parents. If the teams work on the basis of mutual trust, then the goal can be easily achieved. If you are giving homework to your students or you are taking tests on a regular basis then you must inform the parents about student’s progress on regular basis. Don’t shy away from the parents if your student isn’t performing well, trust them and tell them the real scenario and seek their help if required. What will happen if ……….. This is going to be a lengthy and a very detailed article and I shall try to conclude things in the next post.